Participation is restricted to postgraduate and upper-level undergraduate students. email meaghan.mcevoy@mq.edu.au by July 4. Assoc. 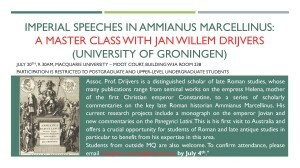 Prof. Drijvers is a distinguished scholar of late Roman studies, whose many publications range from seminal works on the empress Helena, mother of the first Christian emperor Constantine, to a series of scholarly commentaries on the key late Roman historian Ammianus Marcellinus, and studies of the Syriac Julian Romance. His current research projects include a monograph on the emperor Jovian and new commentaries on the Panegyrici Latini. 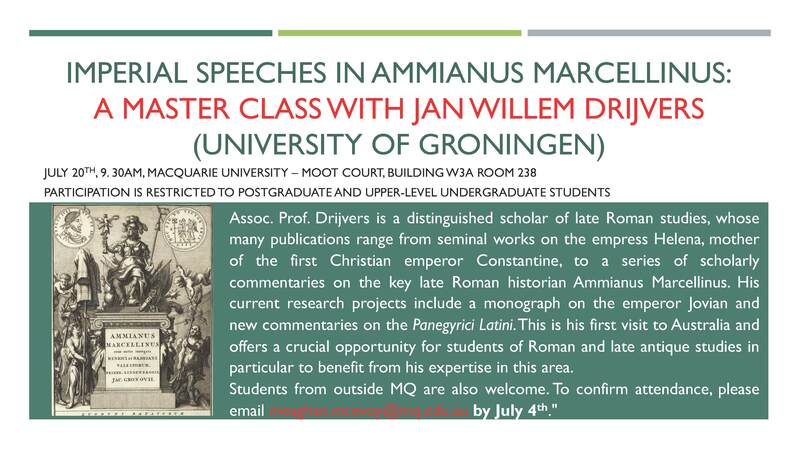 This is his first visit to Australia and offers a crucial opportunity for students of Roman and late antique studies in particular to benefit from his expertise in this area.